Patrick McEleney has made a full recovery from his sudden collapse on the pitch on Saturday night. PATRICK McELENEY admits he was ‘scared’ after collapsing suddenly and momentarily losing consciousness on the pitch at Markets Field on Saturday night. However, the Shantallow man has reassured Derry City fans that he’s made a full recovery from a Shingles virus and dispelled fears of a heart irregularity or indeed a punctured lung. McEleney was treated on the pitch for six minutes after falling to the ground clutching his chest and was then stretchered off and taken to a local hospital for tests on his heart. He made his way back home on the Derry City coach and, following further tests in Derry, it’s understood that his episode was down to a Shingles virus he had been suffering from. McEleney turned up at training yesterday morning but played no part in the session and insists he’s feeling fine despite the unsettling incident. “Everything seems grand now,” he said. “I was walking across the pitch and got this tightness in my chest and I collapsed,” he recalled. I didn’t really know what was going on and called one of their players to help me, I didn’t know what was happening. It was scary. “I didn’t really know what was going on and called one of their players to help me, I didn’t know what was happening. “It was scary,” he added. “I had the Shingles and the virus obviously just took over. “The doctor was saying it was the effects of the virus,” he confirmed. “I went in the ambulance to the hospital and I was freaking out a bit. I came round a bit then when the chest pain went away and I was fully conscious then. But I’m still a bit apprehensive doing things. It’s weird - it’s hard to explain. “They told me I was lying there for about six minutes but it seemed like it was shorter than that. “I was chatting to Shaun Kelly (Limerick full-back) afterwards and he said it was scary. He said I called him first and then was just lying there. “All the ECGs came back fine and there’s nothing there to worry about. 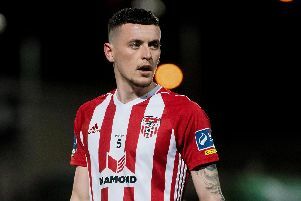 McEleney was one of the star performers of Saturday night’s victory which ensured Premier Division safety for Derry City. He rattled the crossbar with a wonderful strike in the second half and everything seemed to be going to plan until he felt the pain in his chest. “I thought I was playing alright up until that stage and apparently I got man of the match,” he laughed. McEleney has rediscovered his best form in recent games and he’s delighted with how the team has been playing. “We’ve been excellent and the training leading up to the game has been very good. “After 10 minutes down there we knew we were in control and never looked in bother. “We knew if we kept a clean sheet we would win the game. We knew we could score because we were cutting them open and keeping the ball very well. “We didn’t really get any breaks this season and got injuries and never got any momentum going until now. “We got ourselves out of trouble by playing good football. We haven’t really had to battle. “We’ve dominated games which is even more credible in my opinion.” concluded the City playmaker.